See all the love in the sky. Working on new depcoms. These two will be #153 and #154. It’s been a while since the last update, but I have been working. I’ve been adding depcom to Pinterest and deviantART, and doing some infrastructure stuff on the site. The deviantART site is the most work, but I’ve already gained a number of new readers because of it. Furthermore, I’ve also made the strips available as prints, postcards, greeting cards and fridge magnets. I stayed away from the mouse pads and mugs but I actually got requests for mugs, so starting with #51, mugs too (I’ll go back and add the rest later). 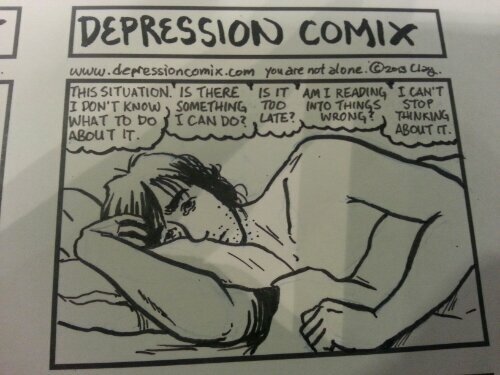 The merchandise can be found here: http://depressioncomix.deviantart.com/prints/ If you buy, remember that you’re supporting an artist! Anyways, just an update because I’ve been fairly silent lately. Go back to what you were doing. 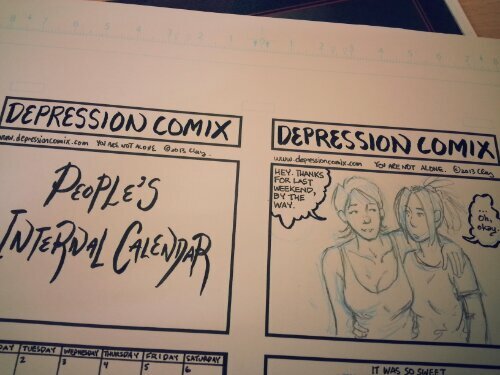 Done inking the next comic, but a copier glitch prevented me from being able to color it. 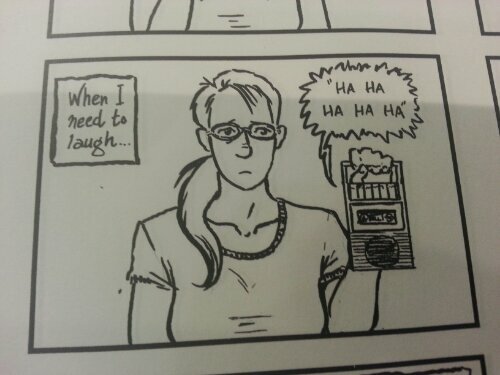 This comic has a cassette tape recorder in it. I wonder if half the audience will know what that is. I’ve also spent my train time watching Cheers and Night Court episodes. Somewhere, it will always be Thursday night on NBC. This is me practically every night for the past fifteen years. I used to be on sleeping pills but they weren’t all that effective, the anxiety was stronger than the pills. I’m in a Tully’s drawing the next depcom. Got it completely inked, just have to color it. 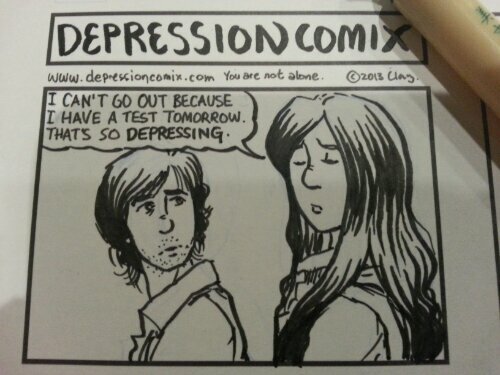 This is a very special depression comix because it contains a first: it is the first time a character in the strip uses “depressed”, “depressing”, or “depression”. I’ve been avoiding these words and it’s taken me 144 strips to get over it. One of the nice things about drawing a comic like depression comix is that I can add characters here and there and I don’t have to worry about things like names or plots. The characters are completely interchangeable. 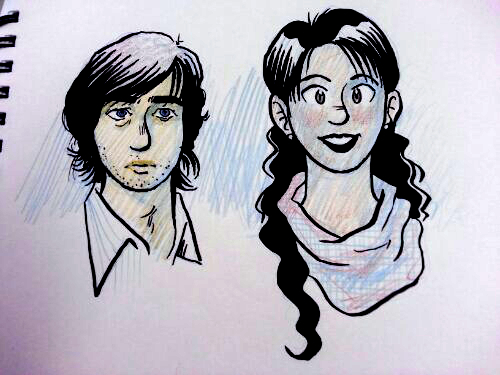 I have a couple of comics in the works and I decided I needed some new faces. So here they are. They may change at will. When I was in the deepest pit of depression, drawing was so painful. Recently it’s become fun again, something I like doing rather than force myself to. You can enjoy things again. It’s possible. I hope none of you have to draw 143 pages of comics to do it.